This entry was posted in climate, politics, SciBlogs, science, Science and Society and tagged climate change, climate change denial, denial, global warming, Heartland Insitute. Bookmark the permalink. This poster and the claims on it, including calling these people “experts” is so ridiculous it actually kills satire. uknowispeaksense: Do you believe this is as ridiculous as the people you seem to believe? Thanks for this interesting article. The attacks on climate change scientists never seem to end. I used to think there couldn’t be anything more immoral in a community sense than promoting asbestos use and smoking as harmless. Climate change denial to protect vested financial interests takes the cake. 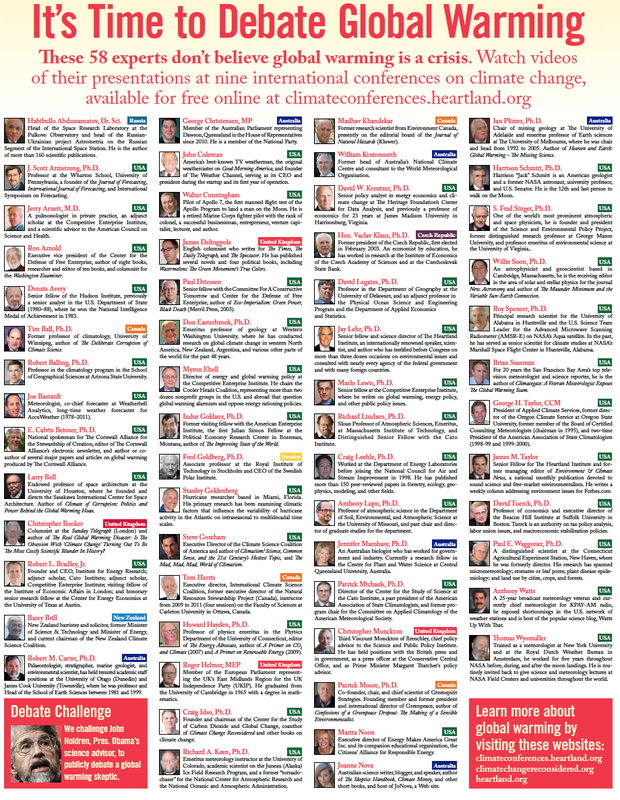 James Delingpole is supposed to be a real expert on the causes and consequences of climate change? Seriously? Ex – an unknown quantity. Spurt – a drip under pressure. I know it’s an old joke, but the author of the poster seems to use it as the real meaning! I noticed they have Tim Ball as a professor of climatology at the university of Winnipeg in Canada . I can assure all here that he is not a professor of climatology . In fact winnipeg being my home town( and having dealt with this bozo) I can tell you the UofWinnipeg did not have a climate science / climatology department during his tenure. In fact Dr Ball’s PhD is in geography. The man hasn’t written anything of consequence in years. He is now retired 78 years old ,living on the west coast of Canada . James Renwick of VUW in NZ also calls himself a climate scientist yet is a geographer. In fact many in the field work in geography departments. Judith Curry is another example. I’m sure you can find some other angle to impugn them with though, as you always do. It has been a while since I visited y’all. Nothing has changed. You still can’t face facts. Earth’s climate is insensitive to the concentration of CO2 in the atmosphere. If it were not so the temperature would be rising rapidly (as CAGW alarmists predicted). Yes, [CO2] has correlated closely with temperature for the last 800,000 years. The correlation has nothing to do with the false Arrhenius (1896) theory. It is a consequence of Henry’s law. Enjoy your echo chamber and the resident Village Idiot (Cedric). So Camel, wanting to divert away from the article then? Must have you stumped or ashamed. Greetings! You always struck me as rational even though we seldom agree. It is beyond obvious that the debate is over. CAGW is fraudulent. You can deride the Heartland list all you want or the Oregon petition with 34,000 signatories or Nobel prizewinners such as Will Happer and Freeman Dyson. Science is not a matter of votes. Currently I am trying to reproduce the work of R & C and extend it to include cloud layers as on Venus & Earth. I plan to meet Tyler Robinson next week in North Carolina.